• Sharjah International Airport is a cargo focused airport. 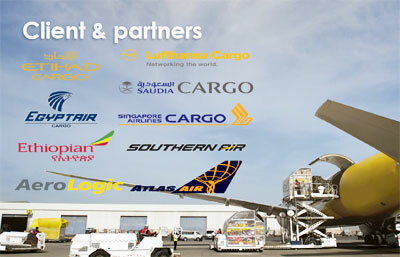 • Over 50 weekly cargo flights by scheduled & chartered operators. • The cargo centre is located adjacent to the cargo ramp area. • Situated along side Sharjah International Airport Free Zone (SIAF Zone), hosting 246 logistics & Aviation related companies. • Open skies with 24/7 non restricted operations. • Member of Cool Chain Association facilitating the movement of perishables. • First airport in the Middle East to be CEIV Pharma certified, compliance from Aircraft to consignee door step. • A strategic Partner of Pharma.Aero, the international body of like minded companies involved in manufacturing and distribution of pharmaceuticals. • Minimizing fuel burn from direct approach, no holding and short taxi distance, Cargo parking adjacent to warehousing. • Use of latest technology supporting e-cargo procedures. Availability of all governmental entities under one roof to facilitate documentations. A large and growing network of the home carrier Air Arabia and other Airlines, provides International connectivity, in addition to the freighter routes to over a 100 destinations. • GCC Connectivity that supports door to door delivery requirements. • To serve the community. • Raise our service levels. • Facilitate your needs to the fullest extent possible. Systems are interfaced to each other, WMS is interfaced to customs, scales and volume scanner. Reefer roller bed trucks, ULD cooling dollies and Bulk cooling trailers are temperature controlled and monitored. RTM with pre-alert settings enable SAS to proactively avoid excursions throughout the time your valued shipments are entrusted to us. • Interlining on long-haul services improves fleet utilisation, reduces positioning costs. • Liaison with niche cargo carriers (IL76, AN, etc.) to selected destinations from Sharjah (i.e. Afghanistan, Libya, Syria, Iraq, K.S.A., among others). • GDP compliant repacking services for passive transport packaging available, supporting the development of the healthcare market to African destinations. • Trucking direct to consignee, RTRTM RFS or dry van, from the aircraft side.